Gun cleaning spray grease for constant use. Contains revitalizant. It is used to clean and lubricate the arms. It provides fast and easy cleaning of small-bore and large-caliber rifled and smoothbore arms of all types (hunting, sporting, fighting and antique rifles). It is recommended for everyday care of arms used for frequent shootings (in a shooting range or hunting). It ensures reliable protection from corrosion. Quickly displaces soiling from nooks of breech mechanisms and triggers. Special cleaning components of the grease can easily dissolve gunpowder scale in the barrel bore. 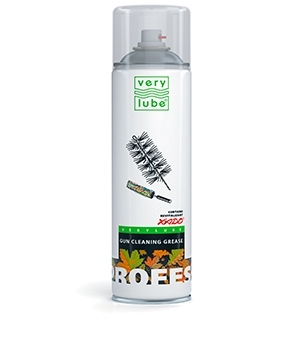 Effectively lubricates threaded, rotary and pinning joints and protects them from corrosion. Guarantees perfect operation of the arms. Owing to revitalizant, the grease keeps the surface of the barrel bore in perfect condition. 2. Spray onto all parts and mechanisms of the arms. 1. Does not contain alkalis; neutral to plastics, wood, painted and lacquered surfaces and blueing. 2. Does not require to be wiped dry. 3. When preparing the arms for a long-term storage, it is advised to use GUN CONSERVING GREASE.